The most fascinating book on birds has just been added to my library. Katrina van Grouw takes away the feathers and displays the muscular system. Then she peels back the muscles to reveal the skeletal structures. She takes a closer look at bird skulls and feet. The artwork evokes the feeling of walking through a dinosaur museum marveling at each splendid exhibit or of finding an ancient DaVinci sketch and wondering if you need white gloves on to be turning pages. The illustrations are very interesting and morbidly cool. Many of the featherless illustrations have the birds posed in natural positions, sometimes in quirky poses, and sometimes in a form that I can only describe as roadkill position. I found the experience of perusing the pages to be humorous and yet moving. van Grouw's text describing what she's showing in the artwork is equally wonderful and enlightening. The Unfeathered Bird reveals things about birds that you may never have imagined, like the coiled wind-pipe of the Trumpet Manucode. Amazing! Interestingly, John Muir Laws recommends in his guide to drawing birds that successful bird artists must have an understanding of what is under the feathers. The same applies to birders. While this book is unlike any other bird book I've ever seen, it's a masterpiece of art and knowledge. It will take you on a journey of discovery that will help you understand the history of evolution of birds as well as deepening your understanding and appreciation of modern day bird behavior. Imagining van Grouw going about the grueling task of collecting, preparing, and posing the dead birds leads me to think that it would make for an impressive documentary. There is more to a bird than simply feathers. And just because birds evolved from a single flying ancestor doesn't mean they are structurally all the same. 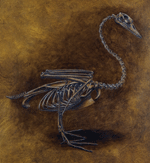 With over 385 stunning drawings depicting 200 species, The Unfeathered Bird is a richly illustrated book on bird anatomy that offers refreshingly original insights into what goes on beneath the feathered surface. Each exquisite drawing is made from an actual specimen and reproduced in sumptuous large format. The birds are shown in lifelike positions and engaged in behavior typical of the species: an underwater view of the skeleton of a swimming loon, the musculature of a porpoising penguin, and an unfeathered sparrowhawk plucking its prey. Jargon-free and easily accessible to any reader, the lively text relates birds' anatomy to their lifestyle and evolution, examining such questions as why penguins are bigger than auks, whether harrier hawks really have double-jointed legs, and the difference between wing claws and wing spurs. A landmark in popular bird books, The Unfeathered Bird is a must for anyone who appreciates birds or bird art. Sounds fascinating, Robert. Would love to get this book!